I love a proper country pub. Beer gardens for summer days, thatched roofs, views of rolling countryside, or fireplaces and comfy chairs for nestling away in winter; they’re the perfect place to spend a lazy day whatever the weather. Throw in locally sourced, well-prepared food; a wide range of local ales and tantalising spirits and you’ve got a recipe for success. The Five Bells in Clyst Hydon is a perfect example of this and so much more. 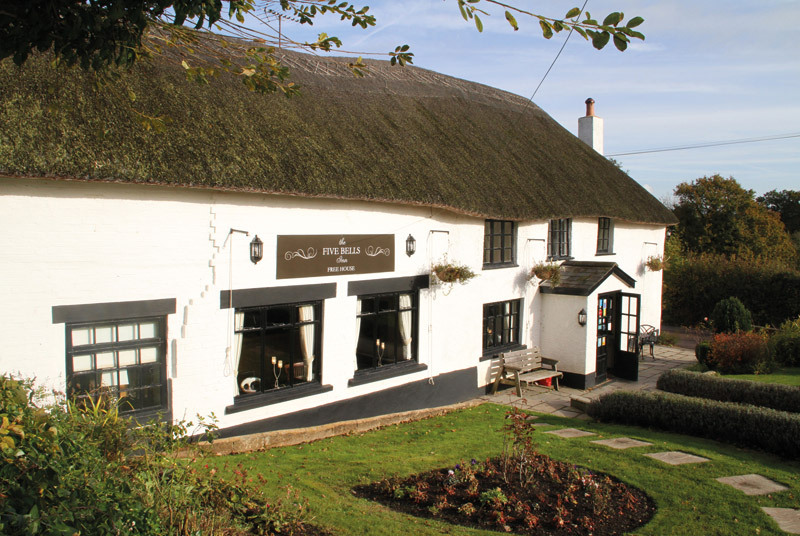 From the thatched roof and fantastic beer garden overlooking the surrounding fields, to the cosy log burner and beamed ceilings it’s every inch the stereotypical ‘chocolate box image’ of a timeless country pub. 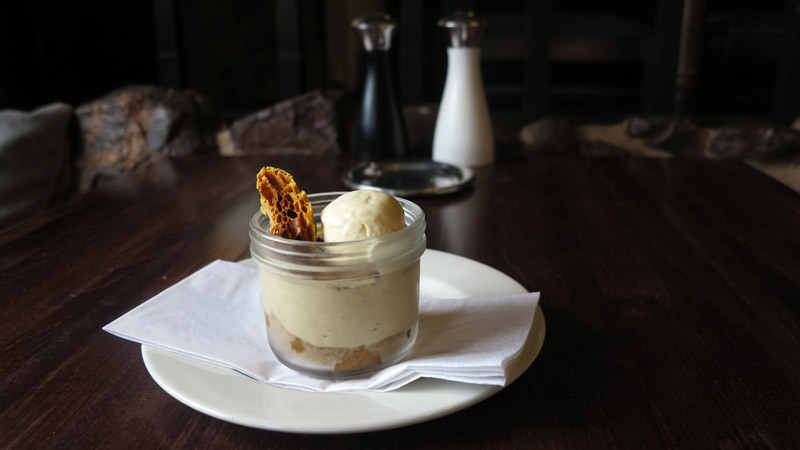 It somehow combines award-winning fine dining with the traditions and welcoming atmosphere of a regular country pub making it suitable for those passing on a walk with their dog – they’re welcome – or a place to enjoy fantastic food with family and friends. What’s more – it’s also at the heart of its community. 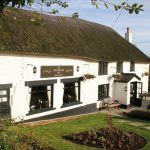 Just over six years ago the pub was set to be converted into flats but the residents of Clyst Hydon didn’t want to lose their much-loved pub and launched a campaign to save it. Of course, this was successful, and we should all be grateful for the hard work, time and money that went into saving and restoring the pub. Current owner James Garnham is especially happy it was saved. 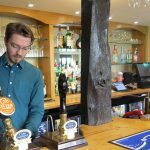 Growing up in the village and moving back just over a year ago to run the pub with his partner Charlotte, he fulfilled his lifelong dream of owning The Five Bells. With strong ties to the local community and a background in running pubs it’s vital to James that the pub offers a warm welcome to everyone. This attitude is obvious from the moment you walk in. The service is so friendly that it does feel like this could be your own local pub. 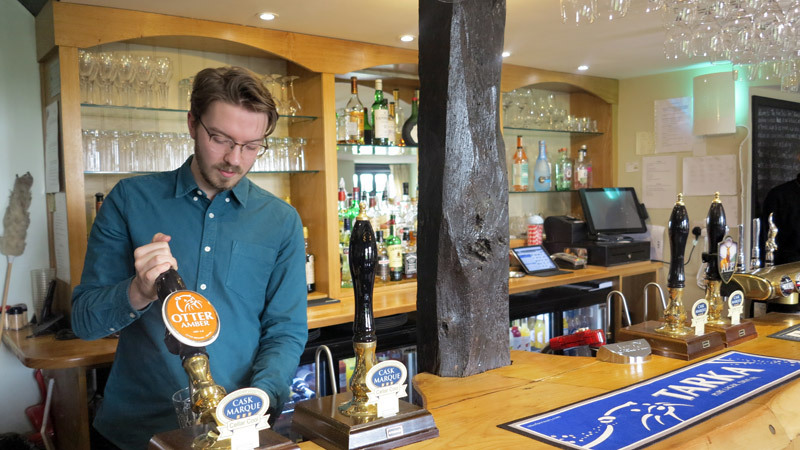 Once we’d ordered drinks from the bar – I opted for a personal favourite Otter Ale but could have chosen from a number of Devonian ales, ciders and lagers – we made our way to the table. Offering diners a choice from either their ‘Pub Classic’ or ‘Specials’ menu, you’re able to pick and choose across two menus offering everything from fish and chips and burgers to Cured Loch Duart Salmon with pink grapefruit, lump fish caviar and fennel or a forest mushroom risotto with truffle oil and blue cheese. 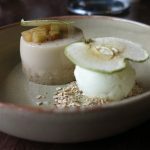 As with all fine dining, the menu uses a wide range of local suppliers to produce ever-changing, seasonal menus which include gluten-free and vegan options. 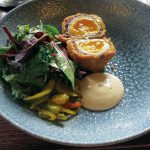 The Five Bells is now just one of two pubs in Devon to hold a rare Bib Gourmand from the Michelin Guide for offering carefully prepared meals and excellent value for money – seriously impressive. To start we decided on the Baked Devon Crab (£8) served with celeriac, fennel and curry spices and the Duck Egg Scotch (£7.45) paired with piccalilli and green leaves – a signature dish of the pub although I’d say that both were certainly worthy of that claim. The crab was excellent, smooth but with small pieces of crab still left whole, giving it a rich texture and taste that was both delicate and spiced to perfection. 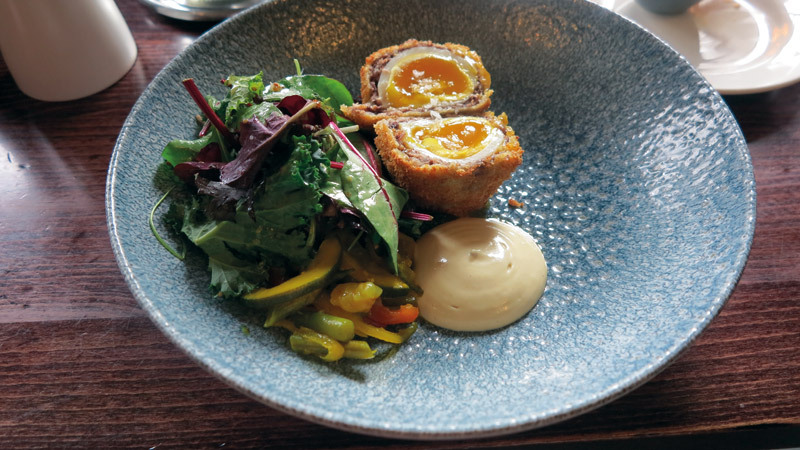 The Scotch egg was again superb – with a perfectly soft yoke and crisp coating it was offset by the homemade piccalilli which was both sweet and sharp. Special mention should also be made of the homemade bread with olive oil and balsamic vinegar which is free of charge. Light and fluffy, with a herb-infused crust it goes beautifully with the oil and vinegar. 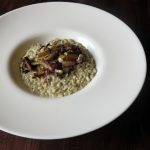 For mains we opted for the Five Bells Burger (£12.75) and the Forest Mushroom Risotto (£13.50) served with truffle oil and blue cheese. The burger was cooked as requested to my liking and was a very healthy size. 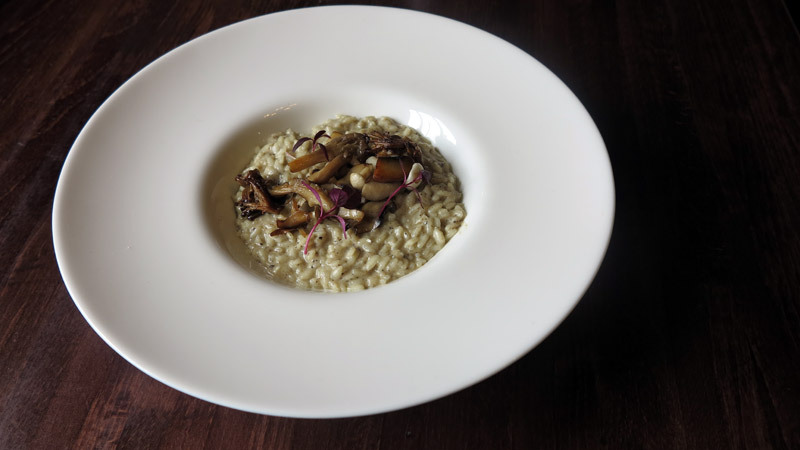 The risotto was a fantastic balance of the earthy flavours of the mushroom and truffle oil and the savoury creaminess of the blue cheese. Dessert consisted of the Honeycomb Cheesecake and an Almond Panna Cotta (both £6.75). 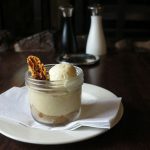 The cheesecake was soft, light and harnessed a decadent biscuit base, only to be given a real crunch of flavour from the delicious homemade honeycomb. 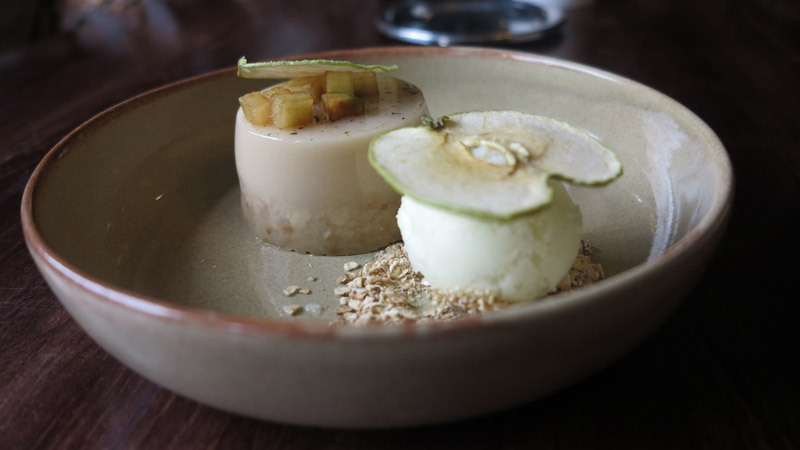 The panna cotta was creamy, rich and completed by the sharpness of a green apple sorbet to make a wonderful finale to a big meal. It’s rare to find an establishment that offers food that comes with such high accolade, yet makes you feel as welcome as if you lived just two doors down. While it may take a little venturing away from where you live, a visit to The Five Bells will have you feeling right at home.